Next time, I need to add some sprouts, so it is a BLAST sandwich, which sounds more appetizing. 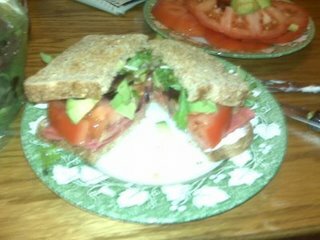 Anyway, it has hearty whole grain bread, veggie bacon, lettuce, tomato, and avocado, with a thin layer of vegennaise. Not pictured: yummy sweet potato fries as a side dish. Locale an example is not the strongest means of influencing another, it is the only means.